OAOA is excited to announce the completion of the L Cantilever House, a private residence located in Riyadh, Saudi Arabia. The villa features an L-shaped plan separating the private and public functions of the house whilst maximizing views to the garden. The client required a private sanctuary with shaded spaces visually connected to the outside. This proved to be a challenge given the climate. 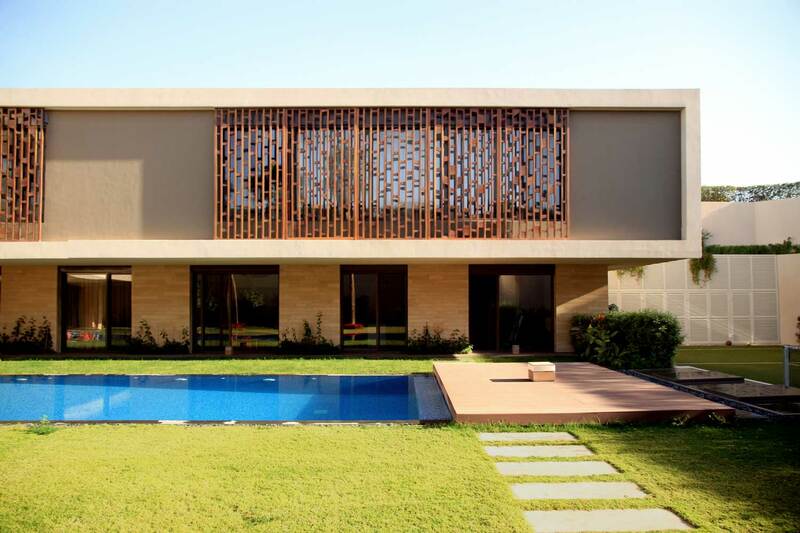 In order to maintain connectivity to the garden, the openings are shaded by deep framed overhangs and sliding screens. The formal living and dining areas are within a floating concrete box spanning 15 meters and cantilevering by 7 meters above a fully openable entertainment zone that flows into the garden and connects back to the cantilevered box through a sculptural spiral stair. An adjacent private wing consists of the family bedrooms, playrooms, gym and a home cinema. The main functional spaces of the garden are consolidated into a single pure rectilinear form that seamlessly merges a sunken outdoor seating area with an overflow pool and sundeck under which lies a submerged hidden “man cave”, with breath-taking aquarium like views giving the feeling of being underwater.